It’s been awhile (again). Work/life really get in the way. 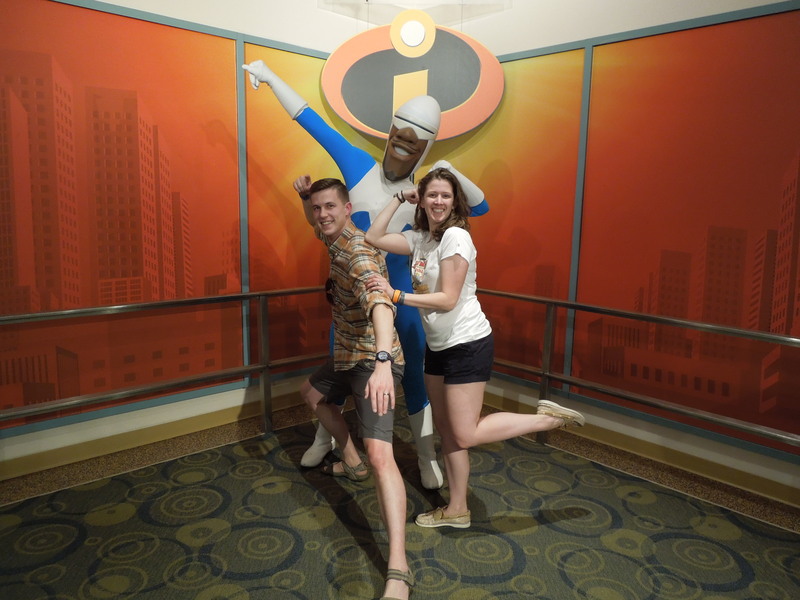 The marathon was about three weeks back and we spent a total of 10 days at Disney (1/9-1/19)! I’m going to break this down into parts because it will get quite lengthy otherwise. Also — I need some help coming up with a new goal. There will be a marathon on the horizon (you’ll see why later), but what other goals should I set for myself? DH and I headed down to Disney on 1/9 for a pretty late night of traveling. We arrived at our resort (Port Orleans) somewhere around 130/2a and zonked out in our room. Yup! 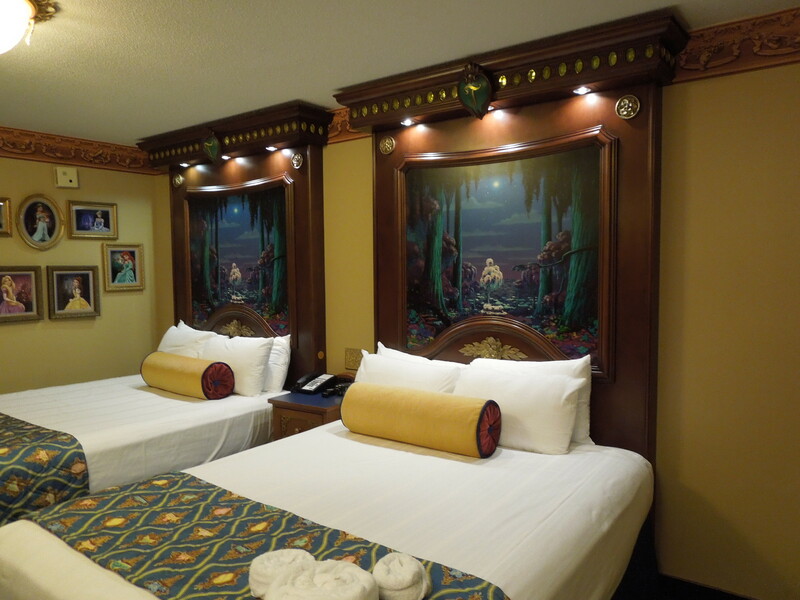 Those are the beds in the Royal Rooms — we got an upgrade for free! Yay! So cool! Friday we slept in a little later than we anticipated an then headed off to the Expo. I had planned to do some shopping and try to get New Balance Minnie Shoes, but we really weren’t feeling the whole crowd thing at the Expo so we just grabbed our packets and shirts and I stocked up on Cliff Shot Blocks for the marathon at a random booth (a lot of them sell them). We browsed the official merch, but I wasn’t really in love with anything. And, they were sold out of the New Balance sneakers in my size — which is probably a good thing, because its not like a need another pair of shoes. We dropped our stuff off at our room then high-tailed it to Hollywood Studios. We were “on call” waiting to hear if DH’s sister made it to Florida (weather back home was not cooperating) so we were a bit distracted. We rode a few rides then took a bus to DH’s parent’s RV (Fort Wilderness). But, not before snagging this awesome photo! 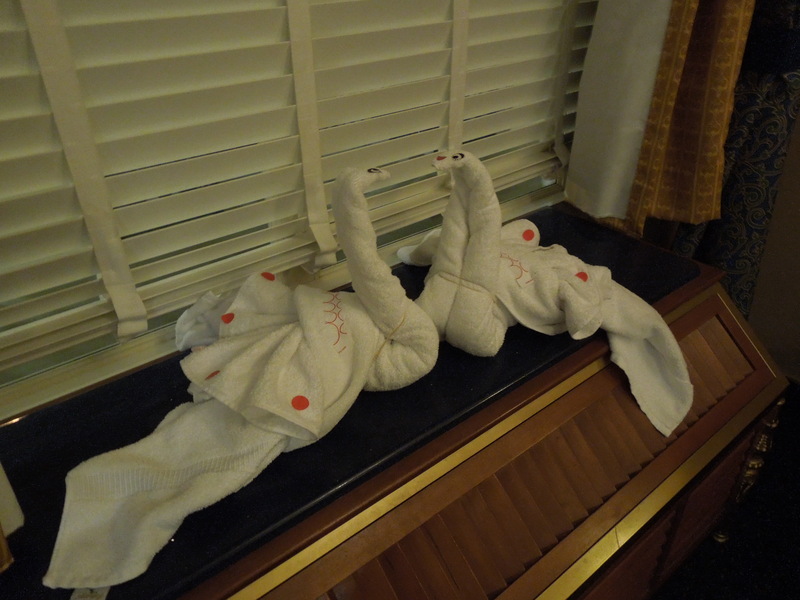 And these guys welcomed us back to our room Friday night! Saturday — our rest day! We were SUPER lazy in the AM and just rested. My parents arrived around 10/11a and since they were staying at our resort we just hung out and waited for them. Dh’s parents and sister made an attempt to visit Magic Kingdom, but were overwhelmed by the crowds. TIP: If you are traveling with people who are not “Disney people” and who admittedly a)do not like crowds b)don’t understand Disney and c)cannot ride many rides for whatever reason, you should most definitely NOT let them alone in the parks until AFTER they have spent a day with you in the park…possibly not even then. We had a lunch reservation at Whispering Canyon Cafe for the whole gang around 1ish. The food was alright and the atmosphere was alright, but I wasn’t super impressed overall. Maybe its better for dinner? DH and I spent the afternoon watching “Wolf of Wallstreet” at Downtown Disney (super intense — still not sure how I feel about it). Our family members braved Magic Kingdom. My parents were able to do quite a bit, but DH’s were not so lucky. Apparently they just walked around for 3 hours, bought a hot dog and left…we didn’t hear much more about the day and were a bit afraid to ask. Sunday was the Marathon so I’m gonna stop here. Pingback: Marathon Trip !! (part two) « Work or Run?